If you saw my Instagram posts over Christmas then you’ll know that I used the opportunity of my Dad being over to do a bit of DIY i.e. 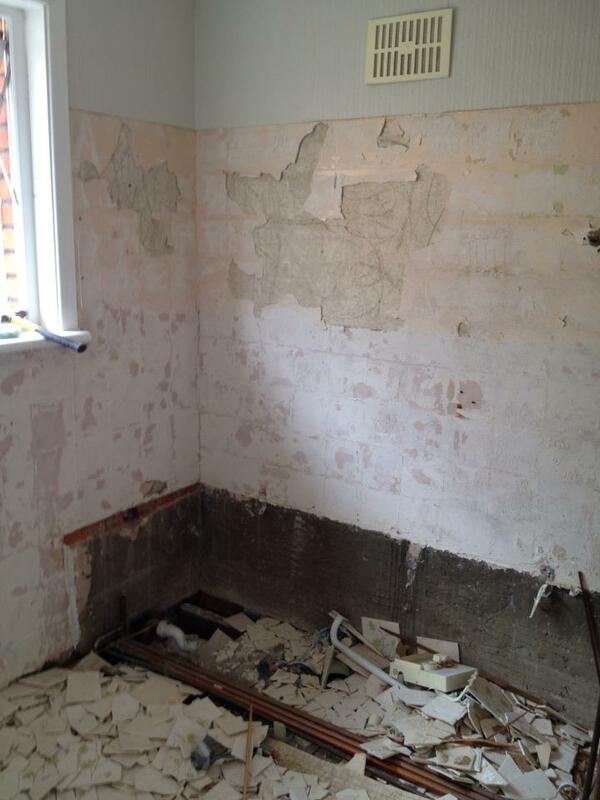 help me with the bathroom renovations that got abandoned a while ago. So, on Christmas Day, oven gloves in one hand and saw in the other, in between basting the turkey (and a few proseccos in) we got the dado rail up and then I spent most of Boxing Day painting, caulking and filling in the holes in the wall left by the builders when the pipes were moved for the extension. The bathroom was initially gutted and ‘stage one’ renovated when I moved in to the house but was put on hold when the extension plans went in due to the fact that the pipes may have had to be moved – not great when you have just laid a solid marble floor and re-plastered the whole room. In the end, only the pipes in the wall had to be moved (no floor excavations) which, although did leave some damage, could have been worse! 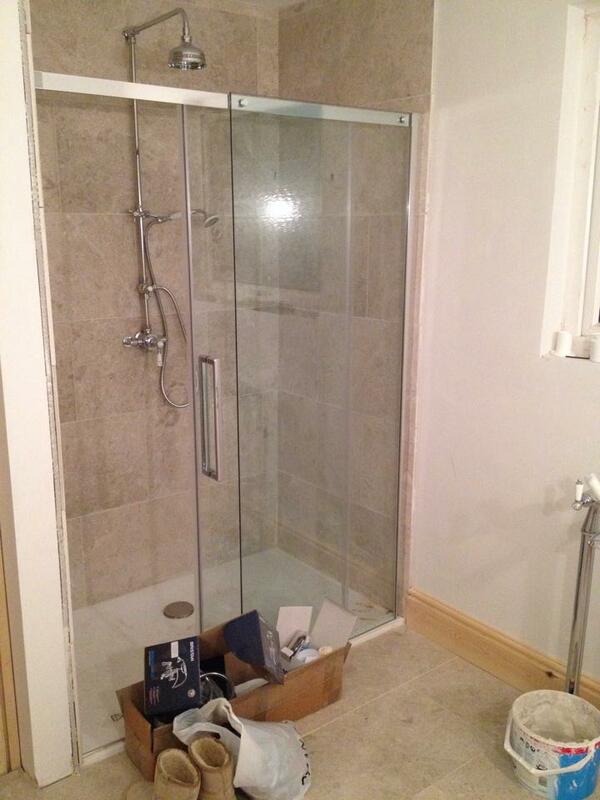 The bathroom and toilet were originally separate rooms and were very dated. 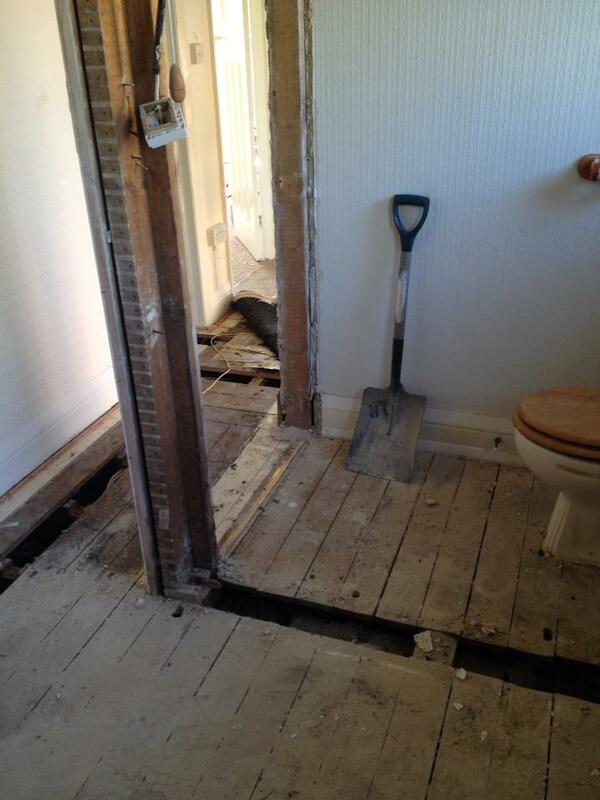 Like the rest of the house they needed gutting. There was an old water tank in a big built in cupboard in the main bathroom that was taken out and the builders found an old chimney breast behind it which had been removed downstairs to make way for the kitchen but had been left suspended on the bathroom floor (kitchen ceiling) so that had to be knocked out too and the ceiling repaired. 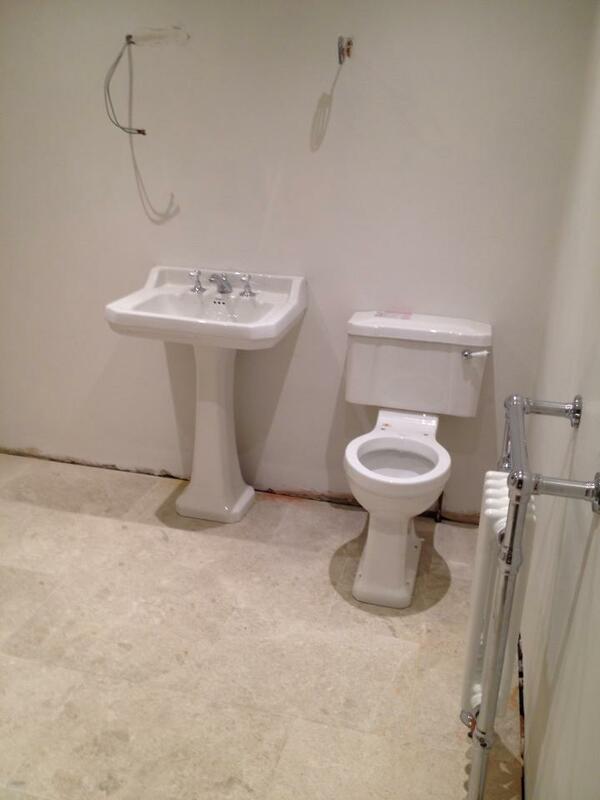 The toilet and bathroom were knocked through to make one larger room. 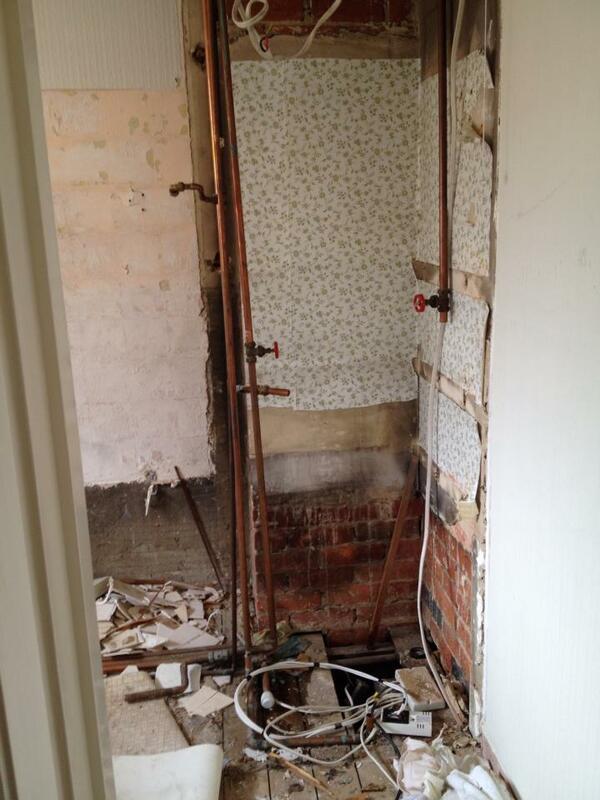 The old toilet door was blocked up as was the toilet window and the original bathroom door was moved out in to the hallway by a few feet to make space for a radiator. The space that was effectively the old toilet was the perfect size for a large walk in shower which left the rest of the room to house a bath, sink and toilet. 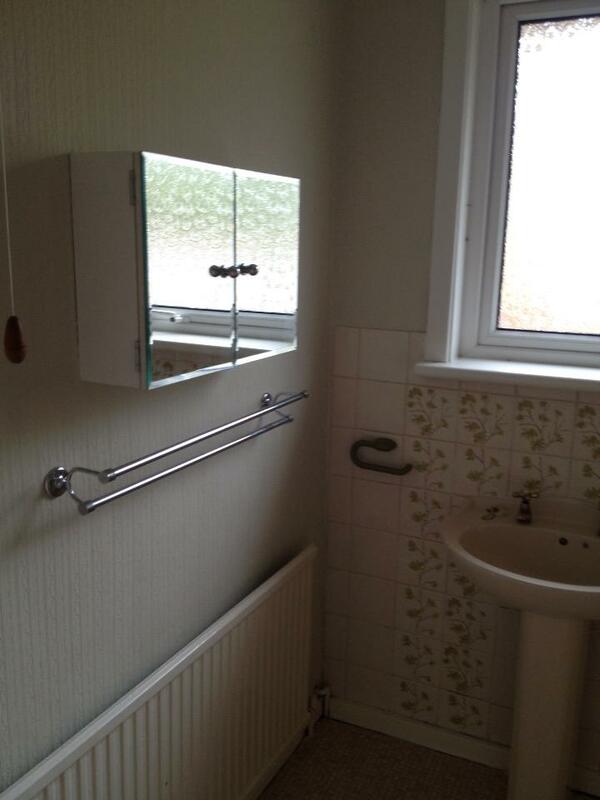 I spent ages tessellating ‘bathroom furniture’ trying to decide what layout would be best. 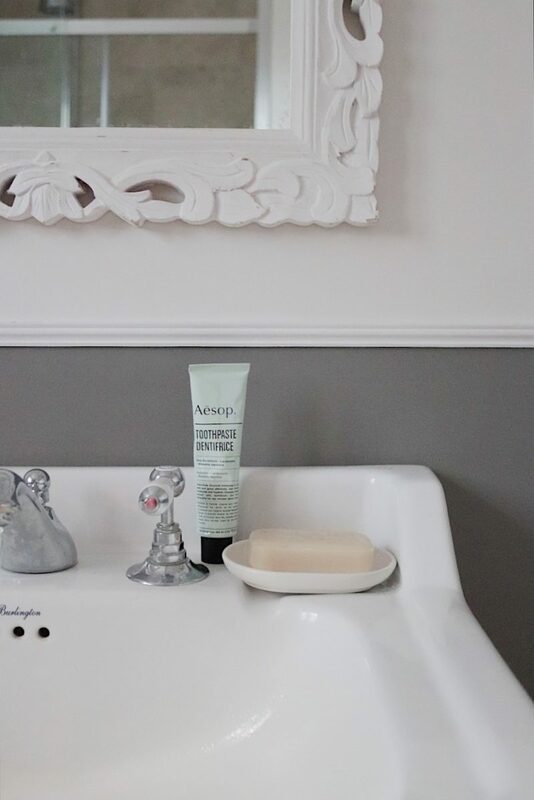 I originally wanted a roll-top bath but, like with so many other things in the house, I changed my mind when on one of the many visits to bathroom showrooms I fell in love with an Ashton Bentley slipper bath! The style of the bath meant that the taps needed to be completely separate on stand pipes which was another plus (I really like them). I wanted all the taps to match in ludibgvthe shower so I looked for a range that worked with what I envisioned and the Bristan 1901 range came up trumps. 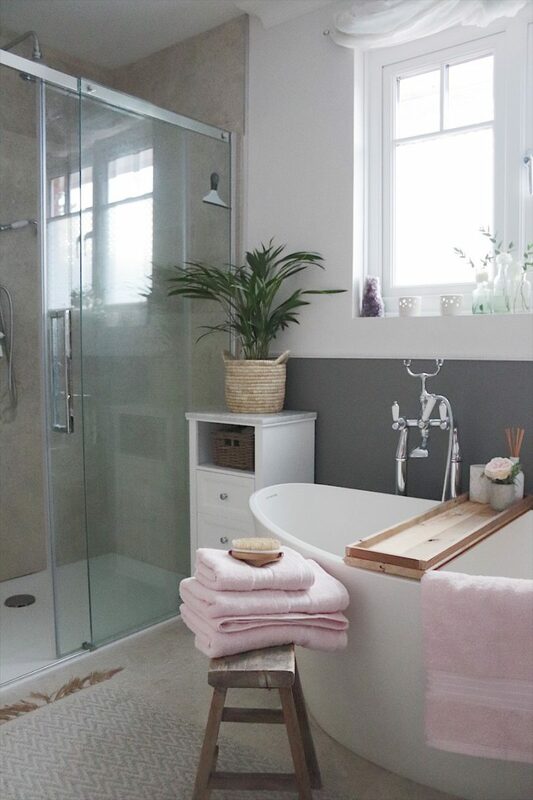 I wanted a traditional ‘exposed’ chrome style shower with lever taps – the same for the sink (theres nothing worse that trying to turn a tap with gunk all over your hands) and I’m so glad I went for this style because it really does make a difference. 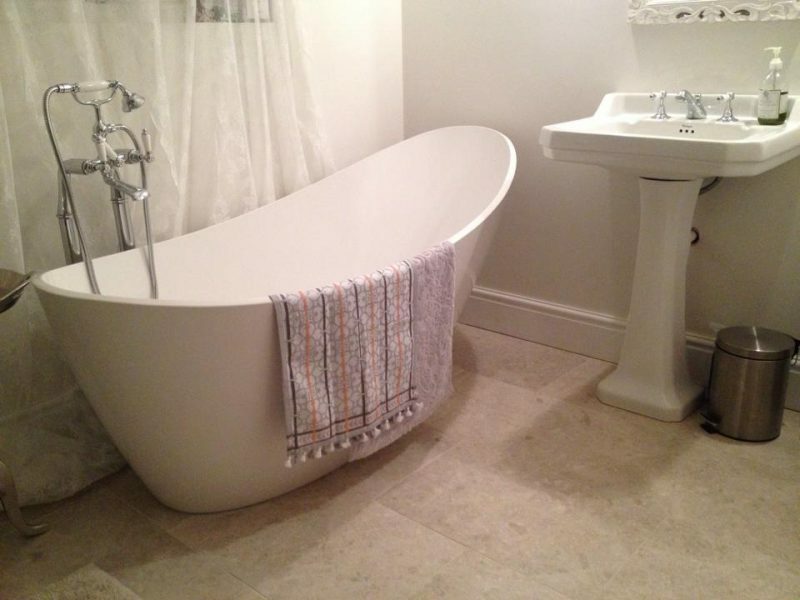 I also wanted a traditional style sink and toilet and chose from the Edwardian range by Burlington. I loved the idea of a marble floor but had a particular colour in mind which took me ages to find. I literally scoured the country and finally found the marble tiles from a supplier called Cesol tiles (they don’t have a website). 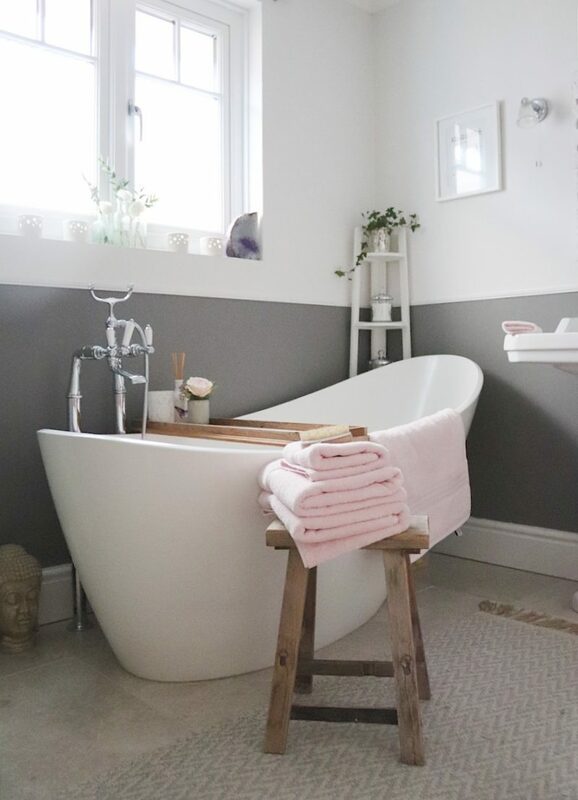 The marble floor looks fantastic but in hindsight, it has been one of the only problems in the bathroom other than the disruption to the plumbing when the extension was done. The reason is that it’s so heavy it has moved a little and the grout has crumbled in places. It was laid for minimal movement – the floor boards were pulled up and a ply was laid first so that the tiles had a perfectly flat surface to sit on but even with that its been problematic. Because tiles are cold, I opted for underfloor heating which is kept tuned on ‘low’ pretty much all year around. Again, it’s another choice I’m so glad I made – I used the same tiles in the downstairs utility extension and they are COLD (FYI they haven’t moved at all – but they were laid on solid concrete Rather than a wood structure). I used the same marble tiles in the shower as I did on the floor I wanted continuity in the look and it worked really well. The shower really is amazing – spacious, easy to keep clean and it’s really powerful (no doubt helped by the new plumbing and super large water tank). I originally wanted a chandelier in the bathroom but was talked out of it by our electrician. Instead, I opted for overhead spots and two mirror lights from John Lewis. In all honesty, I rarely use the overhead spots. If it wasn’t for the fact that the extractor also gets turned on when you turn the lights on, I wouldn’t turn them on at all because there’s definitely too many and its so bright! Like the rest of the doors in the house, the original 1930’s door was dipped (it had about 85 layers of thick white gloss on it) and I sanded and lime waxed it once done to give it a softer pale finish. 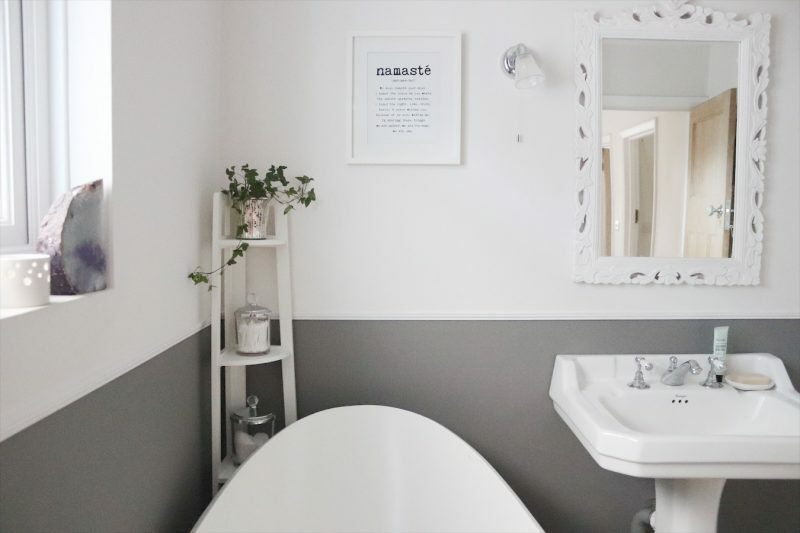 In terms of styling, because I wanted it to be a bit of a ‘zen’ space (my justification for the Slipper bath was it would be like my own spa) I have a few crystals, a few prints on the wall and of course a Buddha head (another Homesense find). 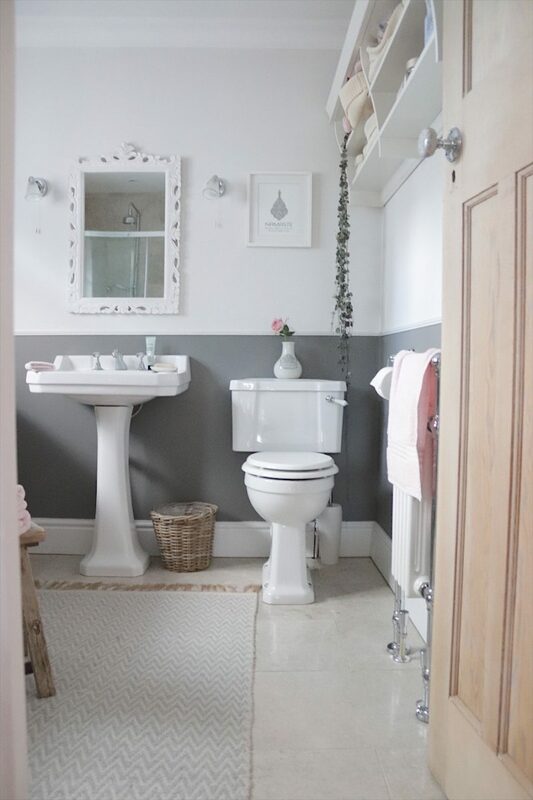 When I finished the renovation off at Christmas and added the dado rail, I really wanted a darker colour on the lower part of the walls, below the rail and opted for Farrow and Ball’s Moles Breath (276) which I’m so pleased with – its a slightly warmer grey and works really well with the shades of pink I wanted to introduce. Hampton and Astley gifted me a beautiful towel set in the perfect shade of pink and I pop in other little flashes of pink through accessories for example a single pink rose in the vintage inhaler I found at an antiques store. For storage, I found a little cupboard in Homesense (all hail Homesense) and got a wall unit from Ikea which, though looks lovely, has really short shelves so you can’t actually stand much on them so I use baskets. I also have a corner shelf which came with us from the old house and was from Cargo but that shop appears to now have unfortunately shut down. The little vintage stool was from an antiques fair and I have put down a rug from Jaba Yard in Brighton. Beautiful work katy. 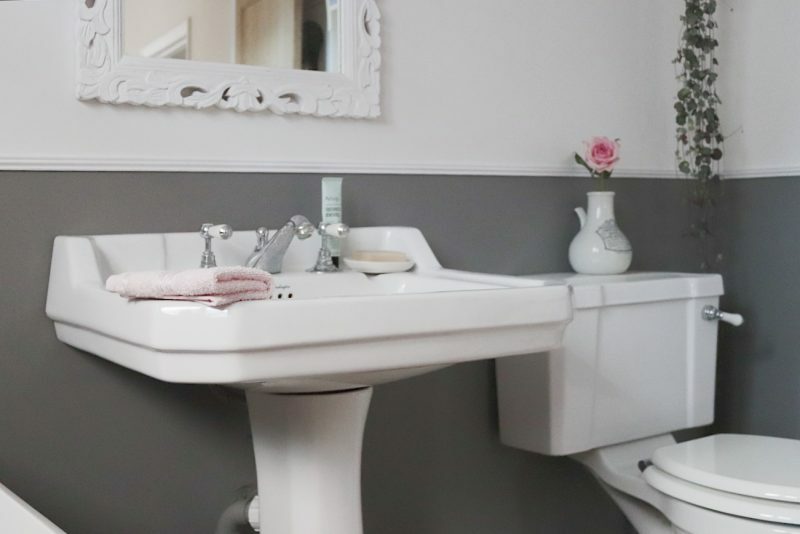 Looks so gorgous with the choice of colours and towels are perfect! 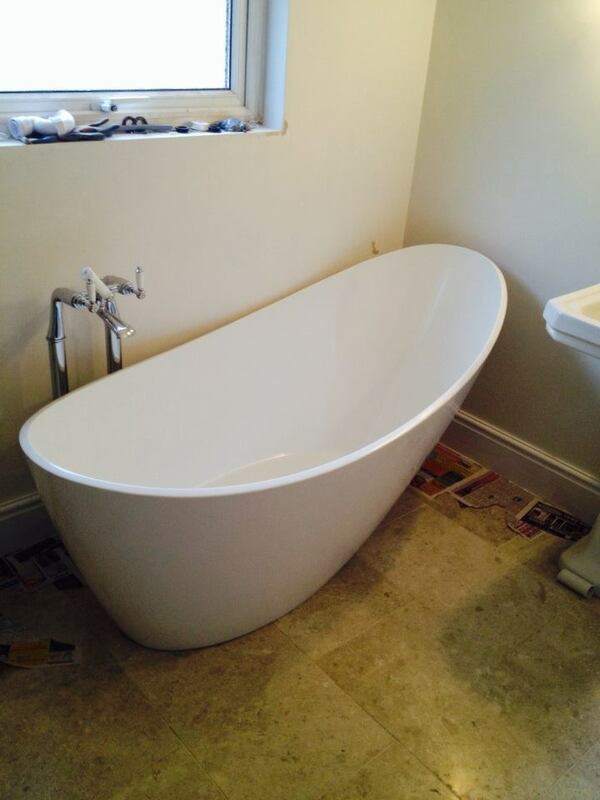 You have also inspired me to go with my gut by mixing modern and traditional bathroom suite as it looks really good! Definately one of the best bathrooms on Insta! amazing job! It looks gorgeous! 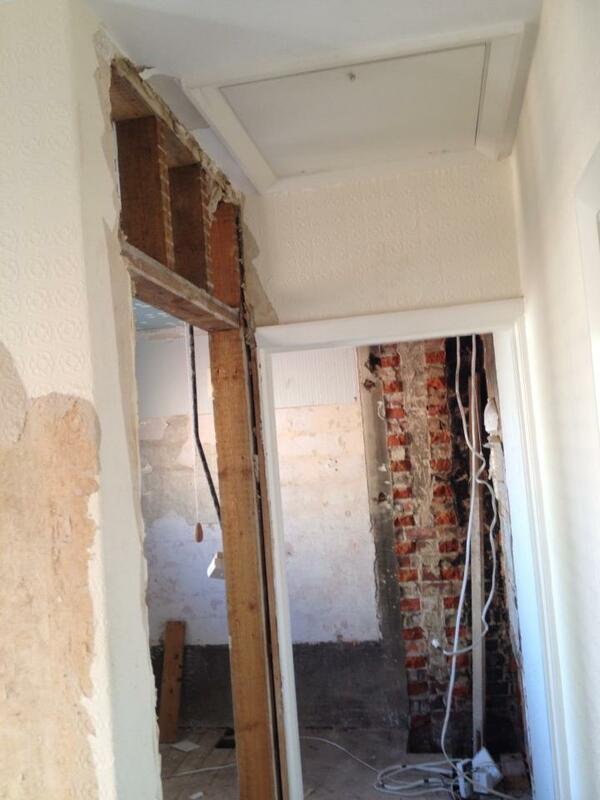 We have a 1930’s very (slowly) being renovated. 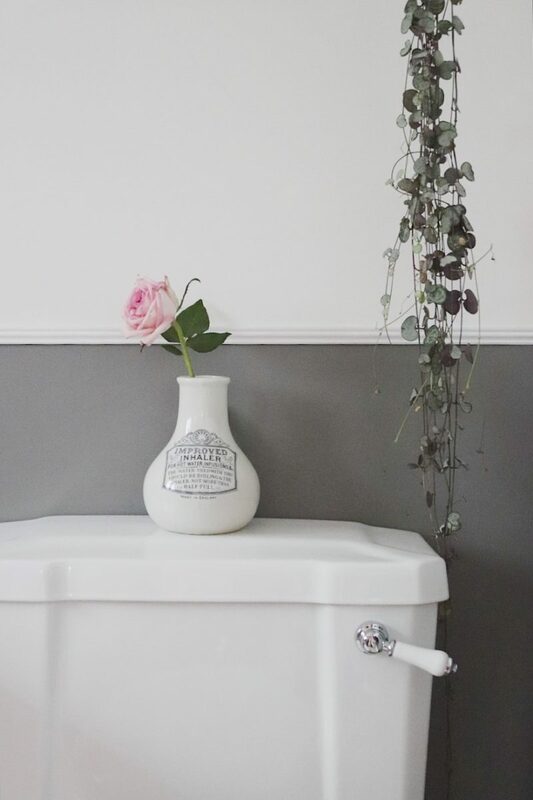 I have decorated in white/pink/grey twice so far and it may well appear again as I love it. Was interested in the ‘door dipping’ though? We have the same doors but painted in white. 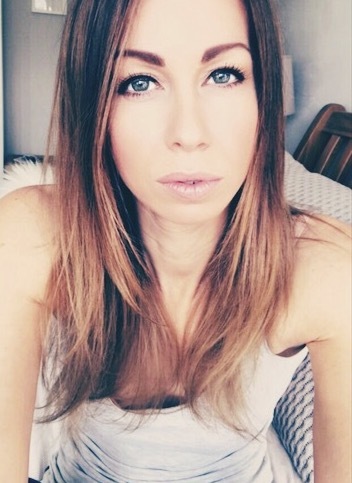 I love the rustic look you have but no idea what the ‘dipping’ is? 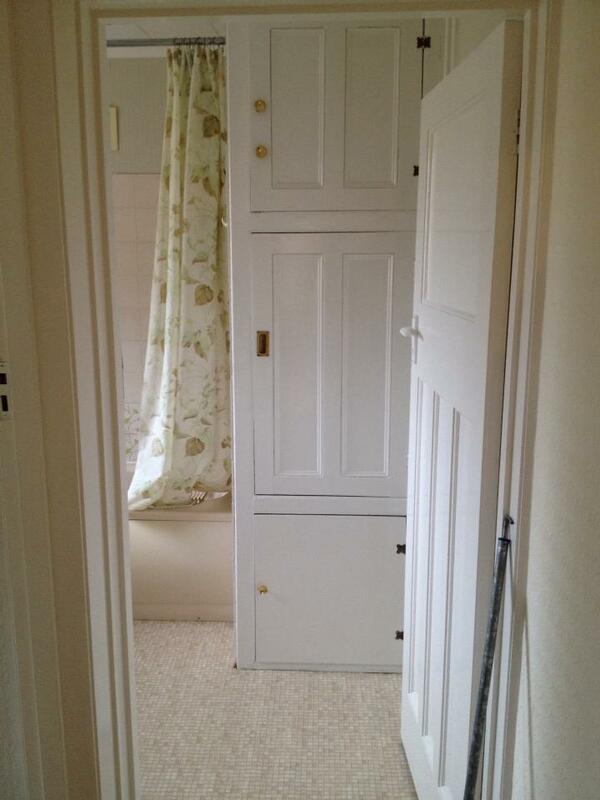 Do you do it or do the doors have to go somewhere….? Hi Karen, I looked up dipping on line and found a local guy who cake and collected and dropped off when done. They smell horrendous at first but it wears off (like public toilet). It can warp the doors but I wanted to take the risk. You still need to sand after to soften the finish and then I uswd lone wax to get a pale effect on the grain. Wow your bathroom transformation really turned out great. 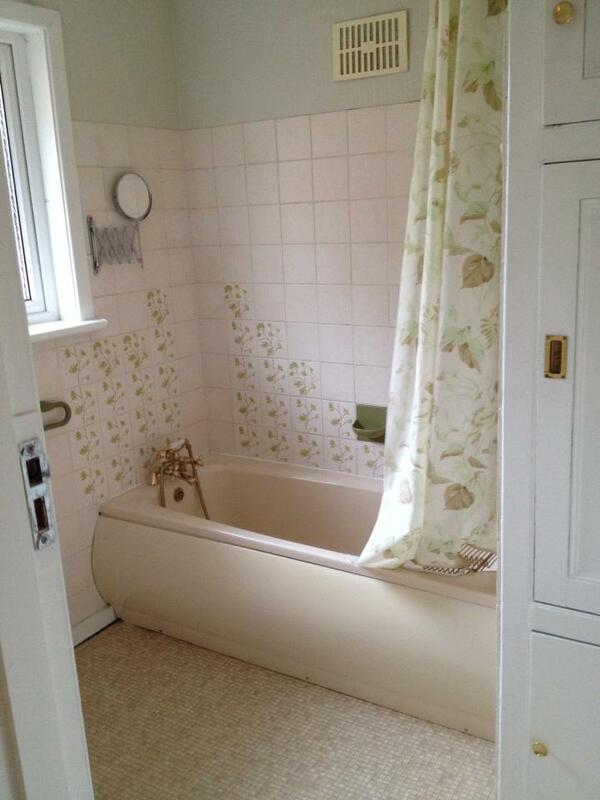 I like the colour trends and the bath tub!